It’s been way too long since I’ve posted anything. I’ve been super busy with a new job but I still have plenty of malting projects on the go and many more ideas I want to try. I’m currently brewing an ale made from a malt that germinated for 14 days. I also made malt with an accelerated schedule that took only 5 days start to finish as well as brewing a small beer with 100% unmalted barley, but more on these later. Firstly, I want to thank all the people that have purchased one of my books. I’m quite happy with how the Malting Log book turned out and I’ve been using it for the last few batches of malt that I’ve made. I have to say it’s pretty darn handy. I did have some problems formatting the Malting At Home book as a reviewer on Amazon has pointed out (the rest of the review is very positive so thank-you Jeremiah!). For some reason, Amazon direct publishing does not, at this time, recognize Google documents. So I had to turn my google documents into Word documents and when I did this the formatting gets really screwy. I’ve corrected the spacing issues as best as I can but it’s not perfect. I’m sure there are better ways to do this but if you’re planning on self-publishing I would highly recommend starting with Word right from the start. I also wanted more pictures but knowing I wouldn’t have the time available for at least four months I decided to get it out sooner than later. I am however very happy with all of the recipes I’ve managed to compile and I was pretty excited when I realized I could use Google translate to read some German and French texts that included some very useful information. I think having all these recipes in one book is handy because surprisingly most of the big expensive modern text books are kind of lacking in actual recipes or kilning schedules. I managed to get to the garden yesterday to plant this years barley. I actually had more Chevalier seed than expected and managed to plant 3 beds with Chevalier. I planted another 3 beds with Maris Otter and there’s a narrow bed that I had planted with the small amount of Bere seed I had. From the other side looking north. 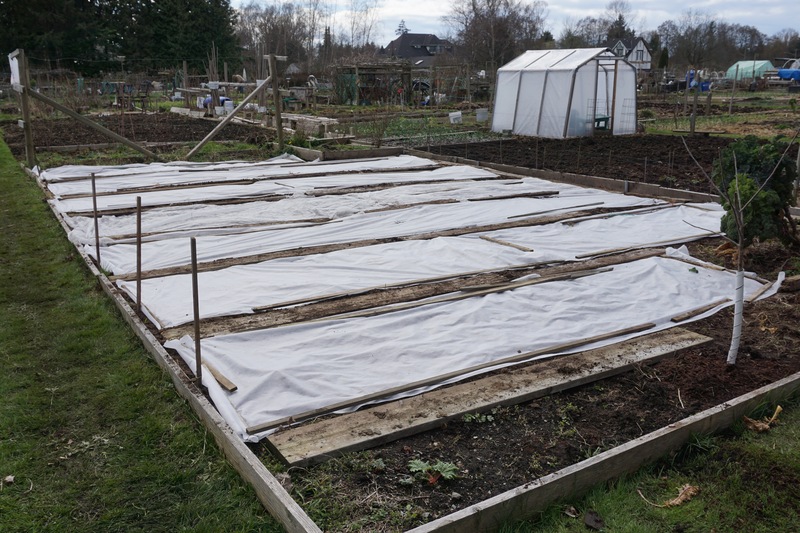 As you can see I’m not taking any chances here and covered everything to prevent the birds and squirrels from digging out the seeds. I’ll remove the covers in about two weeks. 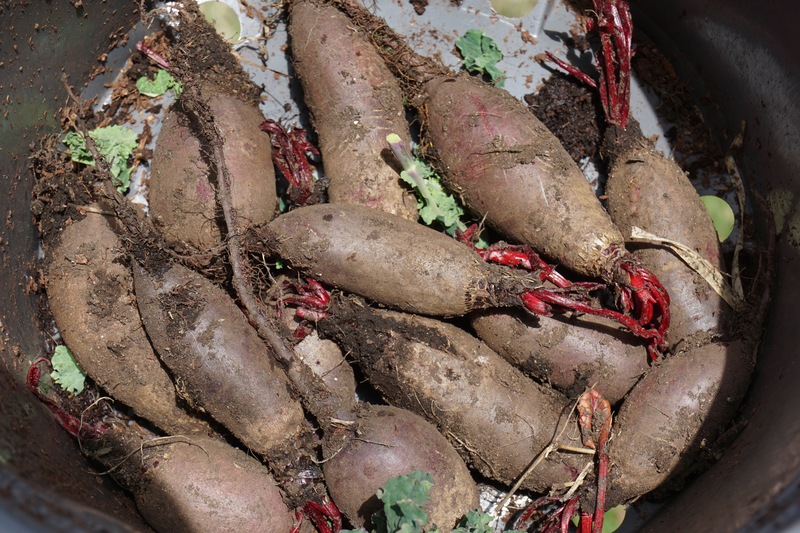 As I was prepping the soil and removing some weeds I pulled out some beets that were perfectly preserved from last year. They had been covered up with a pile of weeds and straw. We ate them that night and they were like new. 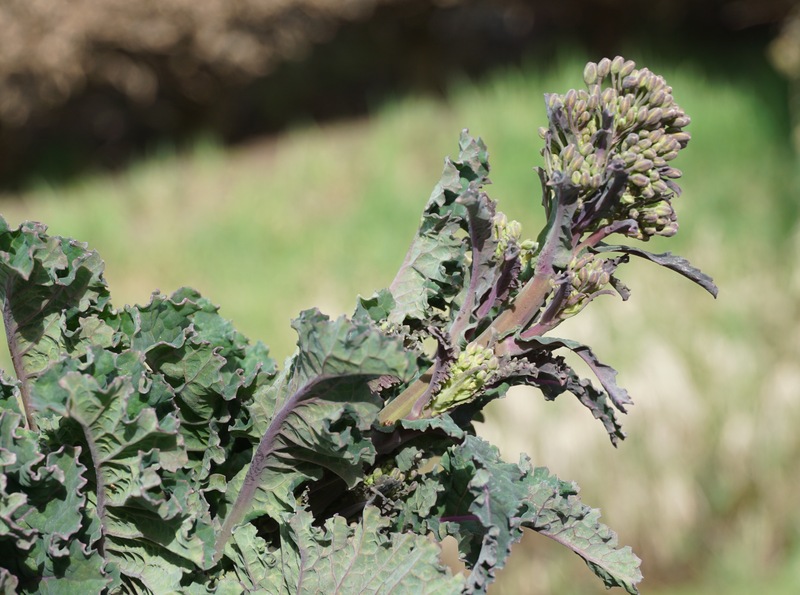 We also had some kale shoots which are very mild and not bitter at all. 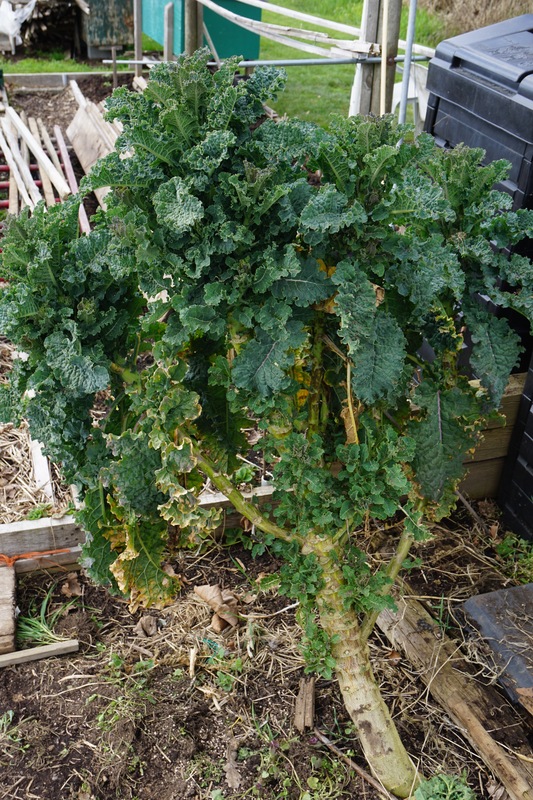 Here’s a shot of the kale “tree” I left in the garden over winter. 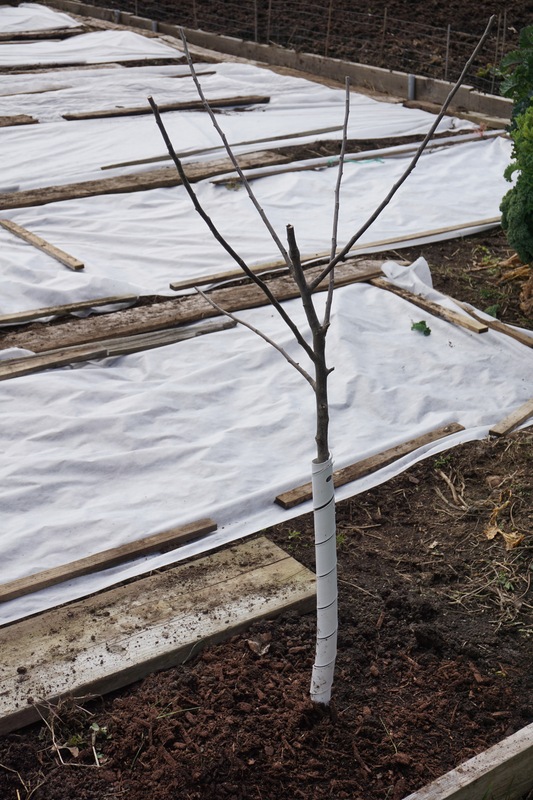 I also planted a Fuji apple tree on the north side of the garden. In total I have about 530 square feet of barley planted this year and I’m hoping to get about 40 lbs. of barley from this. Perfect timing on the garden article. I just got back from California on business and was planning to get my barley planted this afternoon. I’m in Virginia and it looks like we’re only (at the end of March) past the potential for frost. 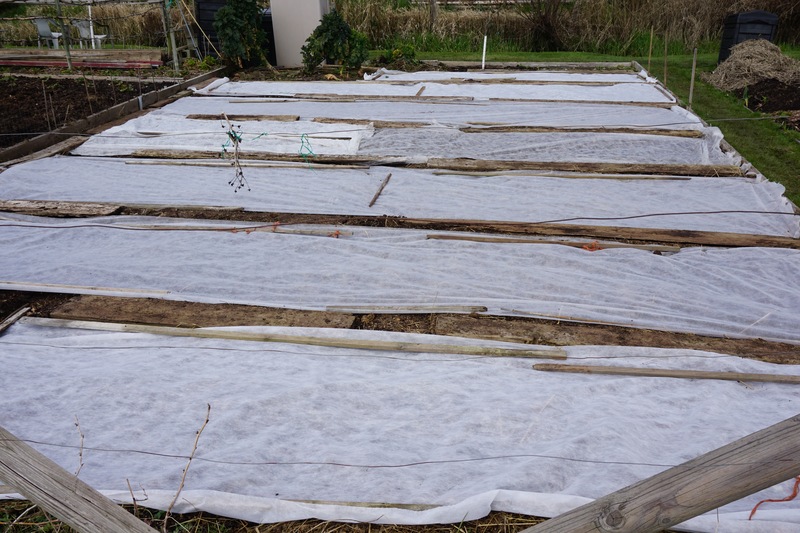 Anyway, I hadn’t considered covering the plots with plastic, but I had been worried about what birds might do to the seed. I also have a lot of squirrels and the other critter I’ve been worried about are moles. By the end of winter, the moles tore up the entire yard. This has been an ongoing problem for years. At least they loosened the ground up for me haha. I just wanted to clarify something on the plastic. Do I need to lift it and water or can I just plant, cover, and leave it for 2 weeks as you suggested? FYI, I’m doing a 10 by 10 of both barley (organic Conlon from Johnny’s) and a patch of wheat. Hey Jonathon that’s actually not plastic but remay. It’s a very thin landscape fabric that allows water and light through it. I should clarify this in the post because it does look like plastic in the photo. I find that it does speed up germination a little too because it warms the soil. Let me know how your barley turns out. Cheers! I finally got my garden planted (April 13th). I planted three different grains, an organic Conlon from Johnny Seeds, and Pinnacle also from Johnny’s. I also planted a bed of hard red wheat. I took your advice and covered the beds with garden fabric. Hopefully this will keep the birds away. Anyway, I have a few questions. I purchased 5 pounds each of the Conlon and Pinnacle from Johnny Seed and only used 1 pound each. Would it be okay to set some of this aside for next year, or should I go ahead and just malt the remaining seed? I have read that seed has to be stored very meticulously to keep it viable. Also, I watered in the garden very well before covering with fabric. How often should I water the newly planted seed? Hey Jonathan, seed can last for years depending on how it’s stored. The Maris Otter seed I planted is three years old. As long as it’s dry (under 13%) and in a cool dry place with fresh air circulating it should be fine. I keep my seed in brown paper bags in a drawer in my house so it’s not even cool. I check it every so often to make sure there are no bugs in it. As far as watering goes at this stage it depends on your soil drainage. If it’s draining well it would be hard to over-water, but if you have puddles that don’t drain, this may kill a young plant. My garden is near Vancouver so it’s rained almost every day since I planted, we have pretty good drainage so the top foot of my soil at this time of year is fine, lower than that and you hit a lot of water but this will start to dry out during this month.